Plant callas lilies outdoors in a location that gets bright, morning light. They like some late afternoon shade, particularly in hot-summer areas. Keep them well-watered and weeded. Callas grow best in a moist soil that includes some organic matter. Plant the bulbs 4 to 6 inches deep and 1 to 2 feet apart. They can be planted 6 to 12 inches apart when grown in pots. Fertilize monthly with a good all-purpose fertilizer. Although calla lilies are known as 'spring bulbs,' in tropical climates or USDA zones 8-10, calla lilies thrive outdoors year-round. They can be planted at any time! In other areas, they can be planted when temperatures rest higher than 55 degrees F (below 55 degrees, calla lilies stop growing). Just make sure that there is no danger of frost or of temperatures dropping below 55 degrees in the first 12 weeks after planting. Did you know...calla lilies make excellent houseplants! They maintain lush green foliage year-round! In tropical climates (zones 8-10), calla lilies can be left in the ground over winter without trouble, although some gardeners prefer to mulch with bark or straw during the colder months. In other areas, lift the bulbs before the first frost, clean off excess soil, let dry out of the direct sun for a few days, then store in a dry location that remains between 50 and 60 degrees F. Re-plant in spring after the soil has warmed and all danger of frost has passed. We occasionally offer Calla Lily (Zantedeschia aethiopica) in a kit that contains a rhizome (the underground stem that produces both roots and shoots), a plastic pot with saucer, and potting mix (some kits also include a clay cachepot). To grow Callas indoors: in a container. To pot the rhizome, first moisten the potting mix. Place the mix in a plastic tub and slowly add warm water, stirring with your hand until the mix is moist but not soggy. Next, fill the pot about 2/3 full of mix and set the rhizome, with the pointed growing tip facing up, on top of the mix. Cover the rhizome with the remaining mix. Water thoroughly and place in a warm room. Keep the soil evenly moist while you await the appearance of the shoot. When growth starts, set the pot in a sunny window (preferably one that faces south). Calla Lilies are one of the few houseplants that thrive in wet, even soggy, potting mix. To maintain a constant supply of moisture, keep the saucer filled with water. Bloom usually shows between 8 and 16 weeks after potting, depending on the amount of sunlight the plant receives. In summer, move the plant outdoors to a spot in full sun. Repot once or twice during the growing season. Bring indoors before frost. In areas where winter lows do not drop below 10°F, you can plant your Calla Lily in the ground in spring in an evenly moist or boggy location in full sun. 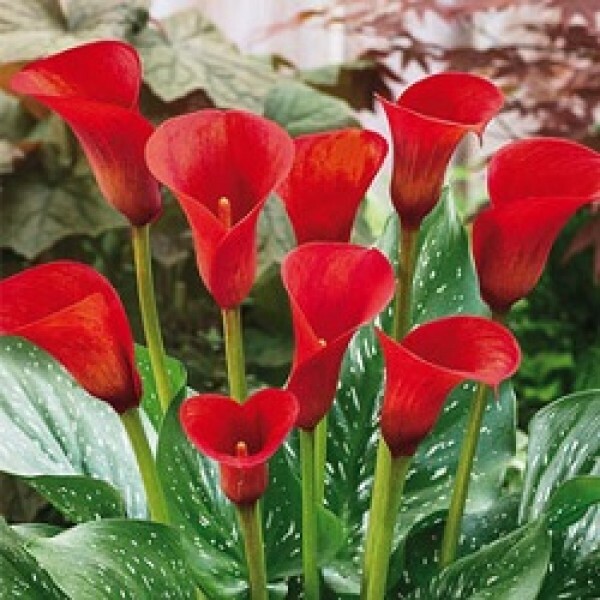 To grow Callas outdoors: Plant after danger of frost has passed in full sun or partial shade (partial shade is required in the South and warm inland areas of the West unless the soil is constantly wet) and rich moist soil. Rhizomes should be planted horizontally, with the growing points facing up. Grow in containers (3 per 12-inch pot) or in the garden. Rhizomes in containers should be planted just 3 inches deep. Hardy to Zone 9 (20°F), but an ample layer of mulch applied in fall can get plants through winter in Zone 8 (10°F) and even Zone 7 (0°). In colder climates, dig the rhizomes when frost threatens in fall and store them indoors in dry peat moss or sand at a temperature between 60° and 75°. Calla Lilies grown in a container can be left in the container over winter. Bring the container indoors in fall and withhold water completely until you want to start growth again in spring. 4 bulbs pack of fresh Calla Lily red. Best time to plant grow: Rainy and Winter. Plant nature is outdoor loves full Sun, less watering. Blooms in bunch and colorful flowers. useful for flower bed, gift plants, flower bouquet.